April's tart of the month is not exactly seasonal. Carrots are available year round but at their peak in late summer and fall. But the fresh herbs and ricotta make this tart light and spring-like, and the beautiful, multi-coloured carrots are striking. This is one of those incredibly easy puff pastry tarts that can be whipped up in 30 minutes or so. Preheat the oven to 425 degrees. Slice the onion. Slice the carrots into medium rounds. These multi-coloured carrots are usually available in the grocery store these days. I almost always see them at my local market. 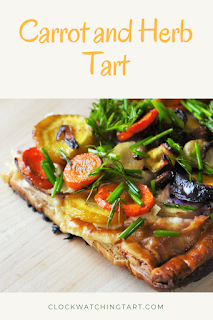 You can use plain orange carrots if that's what you have, but the coloured ones really look amazing on the tart. Heat 2 tablespoons of oil in a large pan and cook the onion for 5 minutes. Add the carrots and cook 2 minutes more. Season with salt and pepper and set aside. Unroll the puff pastry onto a sheet of parchment paper. Score a 1-inch border around the edge without cutting through the pastry. Beat the egg in a small bowl and brush the pastry all over with the egg. Prick the pastry all over with a fork so it doesn't puff into a big ball in the oven! Bake for 10 minutes until lightly puffed and golden. Mix the ricotta and cream together and season with salt and pepper. Spread the ricotta mixture over the puff pastry. Scatter the carrots and onions over the ricotta. Bake 30 minutes. Once the carrots are fully cooked and the onions are slightly caramelized, it's all done. Chop the chives and dill and mix with a tablespoon of olive oil. Sprinkle the herbs over the tart just before serving. This makes a great lunch with a side salad, or a lovely appetizer for a fancy dinner and it's not to hard to make!